Peter Gleick knows water. A world-renowned scientist and freshwater expert, Gleick is a MacArthur Foundation "genius," and according to the BBC, an environmental visionary. And he drinks from the tap. Why don�t the rest of us? Bottled and Sold�shows how water went from being a free natural resource to one of the most successful commercial products of the last one hundred years�and why we are poorer for it. It�s a big story and water is big business. Every second of every day in the United States, a thousand people buy a plastic bottle of water, and every second of every day a thousand more throw one of those bottles away. That adds up to more than thirty billion bottles a year and tens of billions of dollars of sales. Are there legitimate reasons to buy all those bottles? With a scientist�s eye and a natural storyteller�s wit, Gleick investigates whether industry claims about the relative safety, convenience, and taste of bottled versus tap hold water. And he exposes the true reasons we�ve turned to the bottle, from fearmongering by business interests and our own vanity to the breakdown of public systems and global inequities. "Designer" H2O may be laughable, but the debate over commodifying water is deadly serious. It comes down to society�s choices about human rights, the role of government and free markets, the importance of being "green," and fundamental values. Gleick gets to the heart of the bottled water craze, exploring what it means for us to bottle and sell our most basic necessity. Bottled water is seductive. We drink it thinking it’s healthier and better for us than the water that comes out of our sinks. When we are done with the bottles, they typically go into landfills. Reading Bottled And Sold by Peter H Gleick has further opened my eyes to this ‘scam.’ As basically the manufacturers of this product put out ads about how it’s so much more healthy than tap water, it’ll make you lose weight, and in some instances will cleanse the soul of the sinner, via blessed holy water which is also sold for profit. 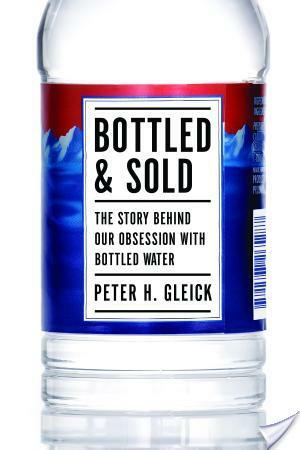 Bottled And Sold by Peter H. Gleick is a non-fiction book about, obviously, the selling of water. It goes into depth on the environmental impact of consuming bottled water. I should probably confess right now that I used to drink bottled water until I decided it was ludicrous for me to spend over a dollar per bottle on something I could get from the tap for free. Call me cheap. Call me environmental. I prefer to think of it this way, each dollar I save by drinking tap water could go towards a new book. Gleick explores the difference between tap and bottled water, and describes blind taste tests conducted. These tests basically found that there was no true difference in taste that people were able to detect. Other tests conducted found tap water to be more regulated and safer than bottled water – as proven by a Cleveland test of, I think, Evian water. I think if you are interested in the green movement, or preserving the Earth, then Bottled And Sold by Peter H. Gleick is something you should read. It is not dense nor is it full of unreadable mumbo-jumbo jargon. It talks about how basically if you buy bottled water sold separately at the gas station, you wind up paying around 5$ per gallon, more money than you pump into your car per gallon. I thought that particular statistic was crazy, and sort of confirms my new book/tap water stance. And I do love it when my stances are confirmed. I've gotta tell you – I hate bottled water and avoid it whenever possible. I can actually taste the chemicals that go into it, bleagh. I actually saw a documentary on this recently. . .well, not on this entirely, but there was a huge section devoted to bottled water versus tap water. I can't seem to remember the name of it, but it was quite interesting, and I wanted to know more. I might have to check this book out! Have to admit that I never understood the whole bottled water craze. Couldn't understand paying for something we can get for free out of the tap, so nice to hear that my instincts were correct! Thank you for bringing this book and issue to our attention. I also think bottled water is a bit of a joke. It is expensive and bad for the environment yet so many of us still buy it! I have to remind myself why I don't need bottled water next time I go to the store! Haha, I once handed out flyers about this very issue. A lot of people are shocked to find out that tap water can actually be cleaner than bottled water, because tap water is so heavily regulated. Great review! Amanda – I don't actually notice the taste of bottled water, then again, I haven't had it in months. Aarti – I'm really glad Gleick wrote this book, as you are right, so many are ignorant of why bottled water is a problem. Brizmus – That sounds like a documentary I'd be interested in seeing, I'll have to google around to see if I find the one you mention. Kathleen – It's so tempting to buy it! Especially when you want to be healthy and the only healthy beverage in the beverage aisle is water (juice and milk are in a different aisle). Might as well avoid that aisle altogether. Dana – That's so awesome. Activists have got to be the coolest people ever. Seriously. I love it when people are motivated to stand up for their beliefs. thanks for this review. The book sounds interesting – I just did some research on water for the social justice challenge and its amazing what an impact bottled water has on the environment. I now tote a refillable bottle! This is such an interesting review. I'm not big on reading non-fiction so I'm glad to have read your condensed version. I'm really guilty of spending a lot of money on bottled water and it sounds like I should rethink it. I actually prefer the taste of Volvic bottled water to tap, but yeah, not so much so that I need to buy it regularly.